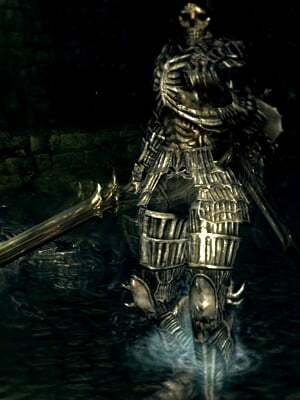 The Darkwraiths were once the knights of New Londo, but when the Four Kings fell into Dark, so did their knights. New Londo Ruins was flooded to contain the Darkwraiths, and all other citizens were drowned with them. The three Sealers were placed to guard the ruins until the arrival of one who could slay the Four Kings. When the Chosen Undead broke the seal and opened the flood gates, the Darkwraiths emerged once more. There ar e 11 of them in total. Easy on backstab. Useful when dealing with more than one at a time. Just one thing: plunge attack with a 2 handed Zweihander +10 and you pancake this guy. He&apos;s history after 2 hits.